Of course, round ’bout February, most kids will be starting to get stir crazy indoors. Plus, those mid-winter vacations are coming up soon… Aren’t they? This simple project is the perfect way to introduce seed-starting to little gardeners and to help keep those tiny hands occupied. Even if you don’t have children, these seed disks make starting herbs indoors simple and quick. I love fresh cilantro (coriander) leaves in my guacamole and I use lots of fresh basil, and other herbs in my kitchen. So last year, I decided to give Johnny’s Seeds pre-prepared herb disks a try, to see how they would work in clay pots. And the results: totally fun and easy project! All you need to do is purchase seed-starting soil (a well-drained medium with super-fine soil particles) and fill appropriately sized pots near-full with the mix. Moisten the soil thoroughly and lay a seed disk atop the soil (pots with a 4.5″ diameter at the top work perfectly for Johnny’s Seed disks). 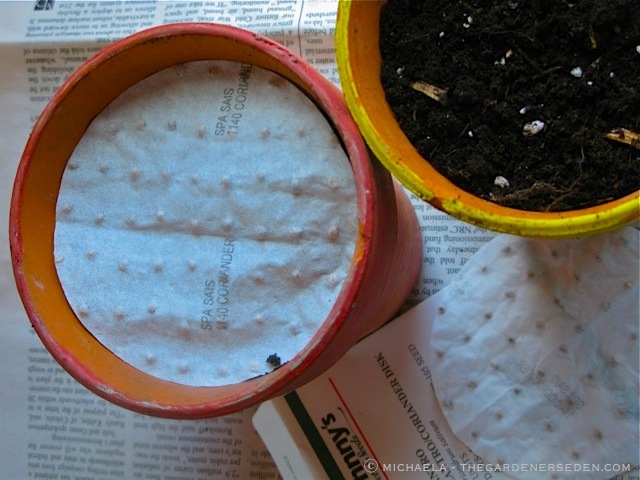 Cover the disk with soil to the recommended depth (varies depending upon the plant – check instructions of the back of each packet) and moisten again. Line your herbs up in a brightly lit window, water regularly with a fine mister and wait. 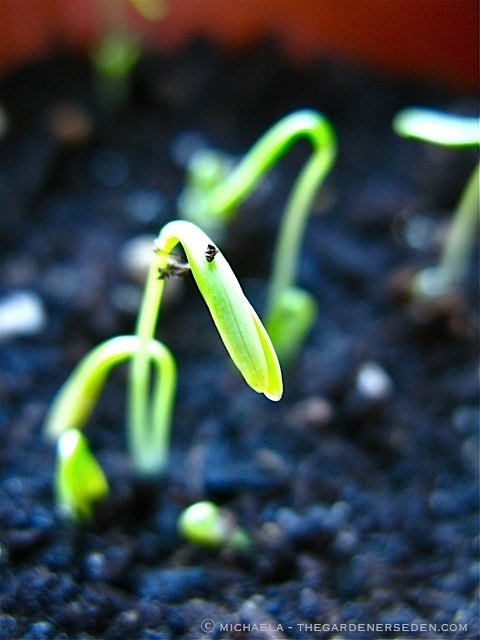 Depending upon the kind of herbs you grow, within a few day to a couple of weeks, you should begin to see bright green seedlings emerge. Be patient, though! Some herbs take quite a bit of time to germinate. 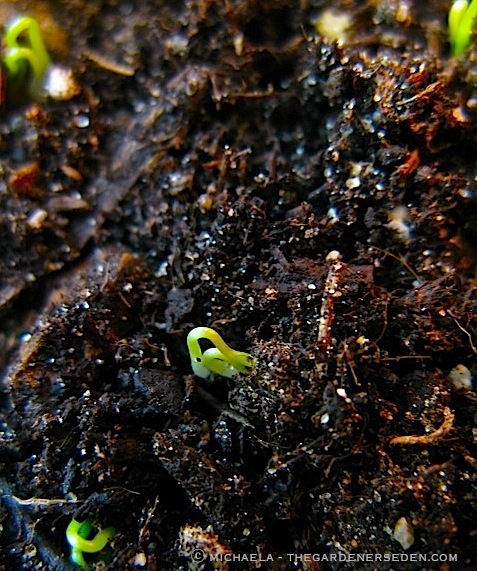 Parsley seedlings, for example, can take a month to emerge. Once the seedlings have popped through the soil, keep the herbs moist, but not soggy. Be sure the pots are located in a warm spot with good light and air circulation. One the first set of true leaves appear (as opposed to the tiny seed leaves) you will want to mix up a weak solution of organic fertilizer (I use fish emulsion), and feed your herbs every-other-week. 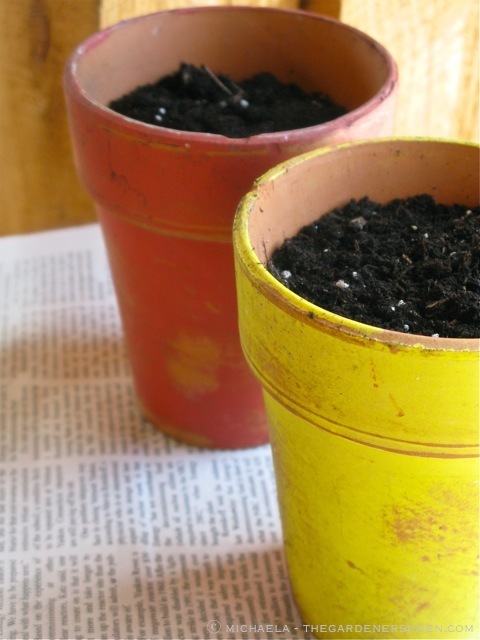 Rotate the pots once a week to keep seedlings growing straight, as opposed to leaning toward the light. For best results, you want to start your seeds beneath full-spectrum grow lights (keep the light source very close to the plants and raise it as the seedlings grow). The nice part of using prepared disks is that the seeds come pre-spaced. Of course you can always start seed without disks; planting them in trays filled with starter soil mixture. If you do this, you can thin the seedlings of herbs and vegetables later on (see photo below). I will be writing much more about starting seeds indoors and out over the coming months, so stay tuned and think spring! 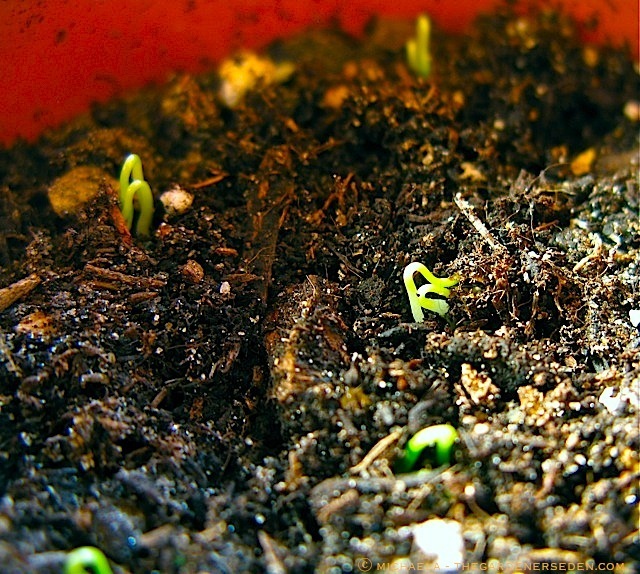 Is there anything more hopeful or uplifting than fresh green seedlings emerging from damp soil? You are currently browsing entries tagged with Coriandrum sativum at The Gardener's Eden.